Sydney are busy building light rail from the city to the South East with it due to open in 2019. The route takes light rail right down George St, where around 1km of the street will become a transit mall. The hoardings on the first two completed sections of George St have now come down, revealing the new, and vastly improved, street environment. These photos come from Tomorrow’s Sydney on Twitter. Given this is the same as what’s proposed for Queen St in Auckland, I thought it would be useful to share the outcome. 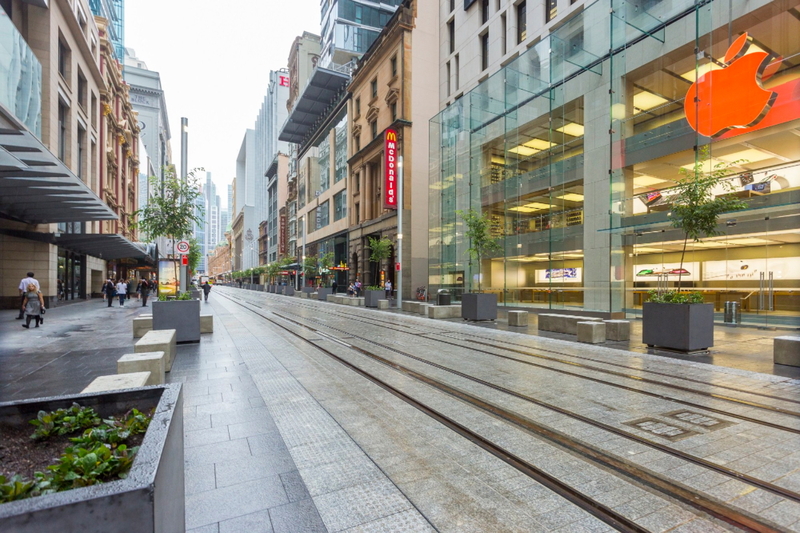 It’s worth noting that Queen St is also wider than George St, meaning we’ll have even more space for people. That looks fantastic and would look great down Queen St too. To give you an idea of the scale of the change, this Google StreetView image shows what it was like before. Here’s another angle if the completed works. When do we start on Queen St in Auckland? Question – is that a third rail down the middle? For power to the LRT? I’d imagine it is: conduction charging, therefore no overhead wires. Yes, there are no overhead wires along the George St section. Overhead wires are used outside the CBD. There are a few different ways they could do wire free in Queen Street. That image is the Alstom system (APS) used in Bordeaux and going into Sydney. It is actually an induction bar, that creates a loop with the LRV when it passes overhead. Unlike a third rail, it is not powered when there is no LRV on it, so no hazard to peds. How much more normally per km to do that system of wire free? 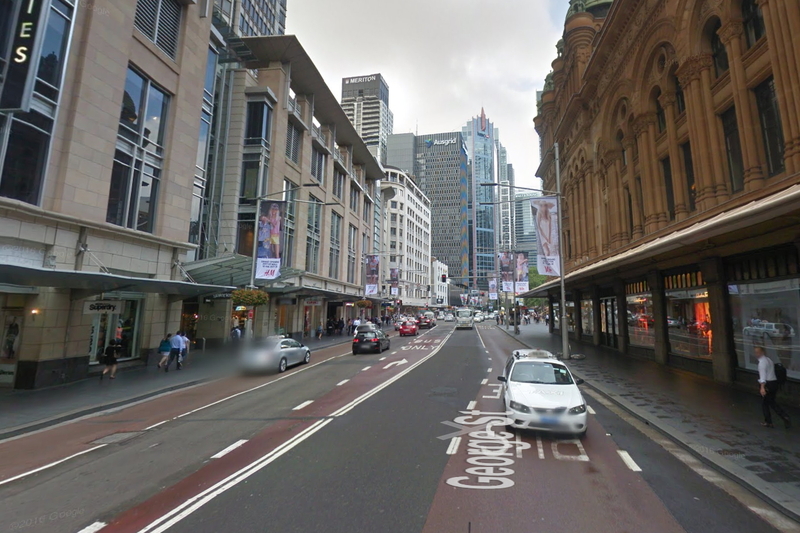 – ie thinking Queen St.
No cars, bugger all people. A perfect world? You clearly haven’t been to George Street before! The amount of people in the before and after shots seem pretty much the same. There is no parking right outside the stores anyway. Plus there is no car parking in the before shots. Who knows what time of day the shots were taken. Given the amount of people that are on the sidewalk in Queen St vs the number of parks. I can’t see how you can argue that it will make a difference. Most people driving into down don’t park on Queen St. They park around it. So it’s just a question of whether the lost of Queen St as a transit corridor for cars will reduce the capacity of the transit system as a whole to travel. I doubt it. May even be easier as you can park further out, take the LRT and be at your location in about the same time as it takes to find a park in the parking buildings downtown. Queen St is a bit more like this at the moment with people on the side walk. Obviously Queen St is wider. I’ll take a camera and get some shot for you, i’m guessing that those photos were taken in the early morning as there aren’t nearly as many people as what I see whne i’m in the city. But how do the cars buy things with all these people in the way? Won’t somebody think of the cars! Many retailers along George Street have complained about revenue falling significantly due to noise and dust from construction deterring shoppers. However, Eddy Keyhani, from Downtown Souvenirs opposite the Queen Victoria Building, said the section of George Street outside his shop looked much better than before. “I like it – it is open and there are less cars and there more people,” he said. The before and after images are quite striking aren’t they. Before looks like any old road in a city. You wouldn’t even know it was the heart of Sydney. After looks welcoming and could be filled with thousands of people who can enjoy the area. WOW! almost temps me to go back, but actually for me Auckland is a much more beautiful city we have to get this light rail started now. I thought they said they were goin to start straight away? Probably best to design it and get resource and building consent before we start building. It is all designed, I think? Consenting and funding… hopefully it can be well underway soon. No, there are indicative designs for the business case but these are nowhere near construction standard. I’d be incredibly surprised if these had been advanced any further as you’d be paying a consultant ~$3m just for designs and that would have to be on a balance sheet and statement somewhere. There is detailed reference design. It’s basically ready to go to market. Construction design would be done by the supplier. Is the detailed reference design public? No, and I assume it will remain confidential for the remaining planning and stakeholder negotiations (very bad form to publish publicly without sorting out the last details with all affected parties first) up to the tendering process, although eventually they’ll need to submit something public for the resource consent application. Masses more design yet to come I would imagine, given the amount of work that goes into these things. Detailed design drawings for tender likely to get the go ahead to start, only once the Resource Consent issues have been resolved. The line in the middle won’t be for charging, that will be at overhead charging points at stations probably. Looks great doesn’t it? 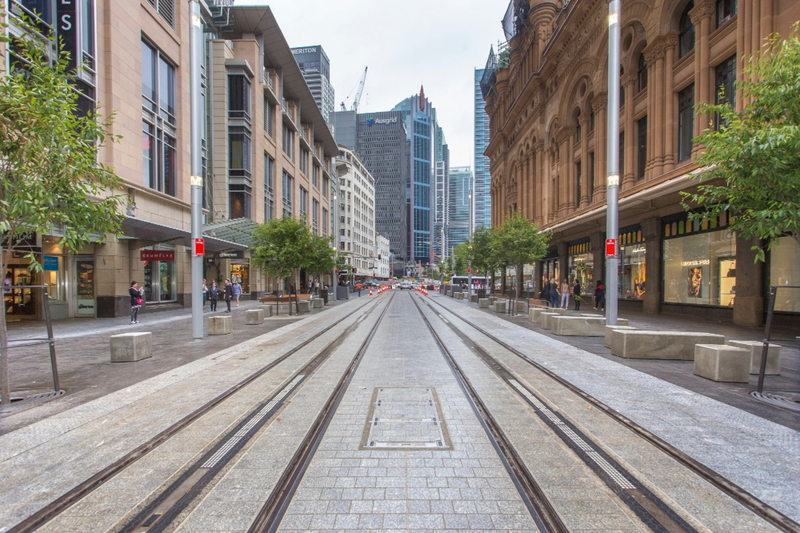 “The wire-free section of light rail will be powered by a third rail which sits between the tracks through the city centre, from Circular Quay and through the pedestrianised zone from Hunter to Bathurst Street. Without poles and overhead wires the CBD’s historic buildings and pedestrian boulevarde will take pride of place. For safety reasons, the third rail is only powered when the vehicle is directly over the rail. Auckland should start building light rail phase one ASAP. We can leave the debate for phase two to airport later. Why? I think the LRT from Onehunga to Manukau to Manukau via the airport will be faster to consent and build. Serve an area that doesn’t really have PT at the moment. Plus hook into the existing network. This route adds to the network, while Queen St/Dominion Rd is really just an upgrade to the existing PT capacity. Something that is needed shouldn’t be the only factor in the decision making. Getting down Dominion Road is involves a lot of stakeholders. I think it’s going to be complicated. I agree, Puhinui to the airport will likely be quickest. But none of it should be that hard, especially where so much is on existing roads and rail designations. “Should not”. But I think it will. A lot of stakeholders along that route. Stakeholders yes, but landowners and financially interested parties, no. Okay what is going in here? Three Lines are up for consideration from the Government with one currently under tender. The Southern Airport Line (Airport to Botany via Manukau and Puhinui Station) is a staged development starting bus and going to LRT. AT have the tender documents out for the Airport to Manukau section done (as bus) + the Puhinui Interchange by 2021 and Botany Interchange 2023. When it goes to LRT is yet to be seen but a rough route has been picked out. The Northern Airport Line or Central Line (CFN 2.0) is something else. I agree with Nicholas Lee that given Dominion Road doing Onehunga to the Airport and linking into the Southern Airport Line would give quickest bang for buck from that direction (the SAL will always be going first due to ease and speed). Then that the Queen Street section of the line can make its way up Dominion Road and finally connect back up with the rest of the line at Onehunga. Remember if we are after express to the Airport from the City Centre then Britomart to Puhinui then Puhinui to the Airport post CRL is best bet. Puhinui is the best win for transit from one anchor to another, no doubt about it. I still want to see LR to Onehunga as a high priority though. Middle line is for power, but only when tram is over it so it is like a third rail. this is beautiful. sooner auckland starts the better. Auckland-Airport is 13km ( plus a new bridge), so using the same cost basis we could be looking at $2,3-2,5 billion….. Sounds like a bargain. Sydney looks great. It would be a bit of a concern if Auckland’s system, built almost entirely on a rail designation and motorway corridor cost the same as a retrofit system, when up to 50% of the costs can be services relocation. The street running stuff is very expensive per-km, there are a lot of underground services, kerbs, lanes, traffic lights, crosswalks, building fronts, side streets, footpaths etc etc to be moved, modified or replaced. The Sydney example is very expensive because it is all in the street corridor. In Auckland, a third of the route on Queen and Dominion would be like this, but two thirds would be alongside the motorway so would be significantly cheaper. Wouldn’t building next to a motorway also be quite expensive with the need to retrofit the tracks under, over or past every overpass and on/off ramp? Sure its not cheap, but its one ramp set every two or three kilometres to be treated. Compare that to every metre of street alignment that needs to be dug up to have the services relocated, every intersection that needs to be rebuilt. The map of the Sydney system shows 2 lines diverging from Moore Park to Randwick and Kensington/Kingsford plus a tunnel under Moore Park so a direct cost comparison with Auckland’s planned network is not really possible. Instead of building a new bridge across the Manuka why don’t they install the bailly bridge back on the old bridge like they did back in the day while they built the new road bridge . It then would be faster to get it up and running while a new rail bridge is being built ? The Old Manukau Bridge is consented to be replaced by the New (Old) Mangere Bridge. Due to the former being (according to NZTA) not safe after 5 years. The consent is for an 8m wide pedestrian and cycle bridge with areas for fishing. I imagine it would be very easy to upgrade this consent to the above plus LRT. Maybe 12m wide bridge. The old Neilson St rail designation is now owned by NZTA. This would put a station at the port and another station at Mangere Bridge close to the town center. If catchment maximisation is the main goal for this route. Then consideration could even be made to run it down Coronation and Bader. Just to note, the old Mangere Bridge, is definitely not safe, and is extremely expensive to maintain. The concrete below the bridge is literally crumbling away, hence they installed the fencing to keep people from the edge of the bridge, it can no longer sustain the loads on the edges. They keep doing patch repairs under the bridge to prolong the life until a new bridge is built, and the new bridge keeps on getting delayed due to various reasons. Interesting. To a degree there is some scepticism about NZTA claims about the bridge having at most five year life left. But I’ve not look into it directly myself. Given that it’s an urgent replacement, doing the right design and rebuild now including the LRT should be a priority. Why would you arbitrarily constrain the new line to the old lesser standards when the two line will never inter operate and have totally separate tracks, depots and systems anyway? The only argument I could see would be to run the inner west line down George Street for better coverage… but that is more an argument for upgrading the Inner west… and it sounds like George Street is going to be pretty busy and probably couldn’t take a third line anyway. If it was the case that “the two line will never inter operate and have totally separate tracks, depots and systems” you would of course be correct, but it isn’t. The maintenance depot for the new South East light rail is at Lilyfield on the existing Inner West line, so South West vehicles will routinely be operating on the Inner West line (but without passengers), using a track connection at the George/Hay intersection. “Never” and “totally separate” don’t apply! Sorry, I just don’t like it! This imposes a stark boundary along the middle of Queen Street which both creates a pedestrian danger zone and occupies a lot of space that could and should be used for people rather than transit. I would prefer to create public amenity here, not an upgraded transit corridor. Can I ask, is it even necessary for light rail to go down Queen St? It seems that all we are doing here is duplicating the route of the CRL from Britomart to K Road and Mt Eden. Why? Is that not wasteful when so many parts of Auckland have such a desperate need for rapid transit? If we want light rail to Mt Roskill and eventually the airport, could we not start from a redesigned Mt Eden station? As it stands this proposal seems to undermine the opportunity to design a truly iconic public space and in return does little more than serve a need that will already be met once the CRL is commissioned. Any requirement for the CRL to have capacity to take passengers off a fully loaded tram at Mt Eden reduces capacity to serve full trains from the existing HR lines. Better to build a separate corridor to take capacity from the new LR lines. Dave its not a choice between LR on Queen or pedestrianisation, but between LR and a gazillion buses. There is an additional transport task to the CRL that must be met in Auckland (it really is much bigger than Wellington) and Queen St is the only viable and available route for this task, so a few clean LR vehicles, or a wall of buses…. Anyway, anyone who has experienced modern light rail in dense city centres knows just how well this works; your fears are unfounded. The light rail could potentially be moving as many people down Queen Street as the CRL does down the tunnel, if they do end up putting both the airport and northwest lines onto it. There simply isn’t capacity in the CRL for that, you’d need a four track tunnel with half the tracks dedicated to shuttling LRT passengers from Mt Eden to Britomart. I’ve been following this and it’s been an incredibly divisive project which has been and still is bitterly opposed. The cost is astronomical and the economic cost to businesses along the route very similar to what we’ve seen in Auckland with many AT projects. I must also add that the Auckland version if it ever happens will be nothing like a world class light rail system. I see very little benefit to closing off Queen Street for this sort of project. The economic cost to businesses of motorway constructions is never an issue though right? I’d be interested to hear your alternative suggesting, although I’m not holding my breath as I think you are mainly here to troll. I feel like the economic costs you are talking about are short term, when compared against the life time value of the business and of the value of the network to the entire city. George street still pumps, my companies head office is based there and I travel there often. I am sure now with this revitalised new design it will become an even bigger economic power house. Apart from delivery vehicles what value is there to cars using Queen St? Queen St would benefit profoundly from this design. Without cars on Queen St, you would eliminate turning movements at intersections, which would vastly improve signal timing efficiency. You could eliminate the silly Barnes Dance pedestrian phase because peds can cross concurrently with side traffic and cross Queen St freely mid-block, plus crossing distances would be much shorter with the elimination of turning bays. Eliminating the ped phase and the turning phases would liberate much of the phase time to reallocate to thru traffic on the cross streets. Delay would be reduced drastically for all users. Yes. Why don’t you like Barnes Dance pedestrian phases? Well, despite my wording, I’m not fundamentally against the Barnes Dance. It’s nice to be able to cross diagonally, but the issue is that when used in place of concurrent phasing, it introduces much more delay on pedestrians, especially on the exceedingly long Auckland signal cycle lengths. As it stands though, many downtown signals are rife with exclusive turning phases (especially seeing the exclusive LT phase in an urban core boggles my mind), which would leave very little concurrent time for pedestrians, given existing conditions. I think there are places in Queen St where there are two Barnes Dance phases per complete cycle, and that seems to work pretty well. I agree the wait between pedestrian phases is important, and is way too long in most parts of Auckland, Barnes Dance or not. Part of the decision between types of phasing needs to take into account the audio signal for vision impaired people. Too often I’ve seen kids setting off in the wrong direction when they hear the signal, and only just get saved in time. With more families using the cycleways (but using the footpaths until they get to the cycleways) this is getting more frequent, and in this situation, the cycling parents can’t hold the cycling children’s hands. For this reason, and because the change to having audio signals is undoubtedly a good change – but with this unintended consequence that compromises the safety of kids – I far prefer the Barnes Dance, and wish we could have it everywhere, as part of a Vision Zero approach. Exactly. And if you got down to it, the same argument will have applied to George St in Sydney. There is no parking there either. Pedestrians will be able to access and shop, largely unimpeded. TRM needs to try harder. I struggle to see how having the ability to increase the amount of people using the corridor is going to negatively affect businesses. Isn’t it in the Businesses best interest to have more people? Or are you just talking about the short term construction effects? That’s what it was! I was like these are the cleanest looking streets ever! no curbs. Or a visual cue to children to stop and check with Mum first. Any studies done on this? I feel like the stone blocks, followed by rail lines, provide a pretty solid cue, maybe even more so than a simple curb (which isn’t in your line of sight like the blocks). Yes, you could be right. And the clean lines are nice. I think some of the stone blocks should be replaced with planters for more softness and diversity. I wonder how blind people cross without getting run down. I can’t help but think we will still somehow end up with cars on Queen St. I just don’t see AT/AC having the guts to do a proper job. Instead they will compromise and try and keep everyone happy. I think you are underestimating the sensory abilities of blind people. Go to Melbourne and Sydney at then tell us it can’t happen. Also the cars are gone, they just don’t know it yet. The dinosaurs are welcome to leave AT and AC if the can’t cope with the carless Queen St valley that is coming. Is there any difference in the transport authority’s culture around enforcement, Patrick, in Melbourne and Sydney? Heidi there no visible enforcement whatsoever on the inner city streets, people just wander amount the light rail vehicles. Works extremely well. AT normally use tactile paving to indicate safe walking routes in shared spaces and streets for the visually impaired. Retailers having problems with a drop off in business because of a Light Rail project. From looking at the photos its a street renewal project that also involves accommodating light rail. They have a beautiful street scape now. If the only goal was to stick in light rail you’d have the old street surface with some rails laid up the middle.